The Program in Community and Agroecology (PICA) is a educational and residential program focused on experiential learning, sustainability and food systems. 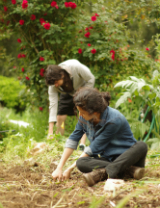 All UCSC students are welcome to participate in the garden workdays and workshops offered. PICA residents have the opportunity to grow their own food together, share meals together, and explore ways to live more sustainably. PICA is located at the entrance to the Village at the UCSC campus, right across from the Center for Agroecology and Sustainable Food Systems (CASFS). PICA participants live in our on-campus residential program in the Village. Sophomores, Juniors and Seniors from disciplines across the Social Sciences, Natural Sciences, Arts and Humanities live, study, grow and prepare food together in the Village housing modules dedicated to PICA. The PICA residential program allows students a way to link healthy communities with healthy food systems. Composting, propagation, bed prep, planting, thinning, weeding, mulching, and more! Above: Students weeding in the garden.